today is the last day to harvest asparagus before the traditional end of the season. on june 24th the germans stop harvesting asparagus to allow the plant to recover. because what we are eating and enjoying so much is nothing less than the sprouts. cutting off the sprouts all year long would kill the plant. that means, i have to hurry up, because i would love to share one or two more of my favorite asparagus recipes with you. so i will start with the asparagus socca. 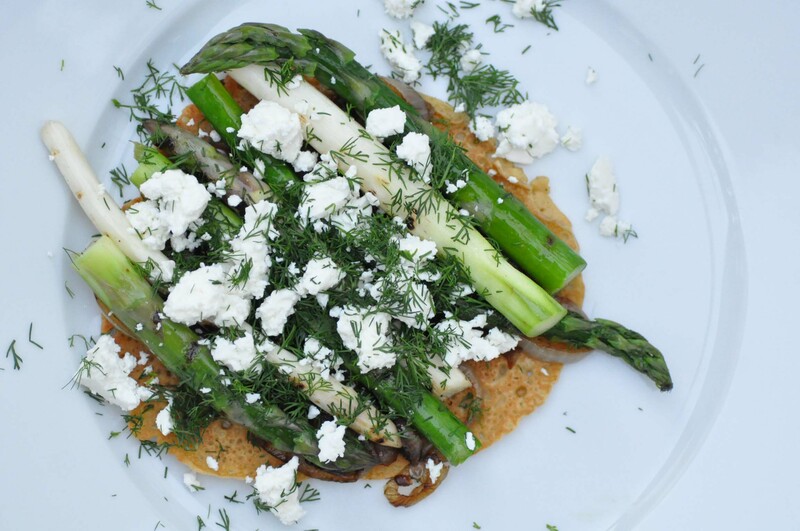 it is something totally different as it combines asparagus with dill, feta cheese and caramelized onions, which i never thought of before! the recipe is from the sarah britton my new roots cookbook, but if you start to google you will find it everywhere – i don’t know who was first. anyway, i adapted the amounts a bit. start with the caramelized onions. cut the onions into thin rings. heat the coconut oil or ghee in a small pan. add the onions and a pinch of salt. cook them over medium heat until soft. once it get too dry for cooking add a splash of balsamic vinegar and set aside. for the socca, whisk together 1 cup chickpea flour, salt and pepper. melt 3 tbsp ghee or coconut oil. add it to the flour as well as 1 1/4 cups warm water and combine. allow to rest covered for at least halve an hour. wash and peel the asparagus. rub them with ghee or coconut oil (melt if necessary before). preheat a grill or grill pan and cook the asparagus for 5 minutes until tender. melt a knob of ghee or coconut oil in a large pan. pour about a quarter of the batter into the pan and cook for 5-8 minutes from each side. put one socca on each plate. cover each socca with one quarter (or halve, depending on how hungry you are) of the caramelized onions. set the grilled asparagus on top. sprinkle with dill and feta cheese. season with salt and pepper and drizzle with some olive oil. mit den karamellisierten zwiebeln beginnen. dazu die zwiebeln schälen und in dünne ringe schneiden. kokosnussöl oder ghee in einer kleinen pfanne erhitzen. die zwiebeln und eine prise salz hinzugeben. bei mittleres hitze weich köcheln. sobald die zwiebeln zu trocken werden balsamico angießen. nach etwa 20-25 minuten sollten sie fertig sein. bei seite stellen. für die socca 1 cup kichererbsen mehl, salz und pfeffer mischen. 3 el kokosöl oder ghee schmelzen und hinzugeben sowie die 1 1/4 cups warmes wasser. gut verrühren und abgedeckt mindestens eine halbe stunde stehen lassen. spargel waschen und schälen. anschließend mit ghee oder kokosöl einreiben und in einer vorgheizten grillpfanne etwa 5 minuten grillen. etwas ghee oder kokosöl in einer großen pfanne schmelzen. einen viertel oder die hälfte (je nach hunger) des soccateigs hineingeben und von beiden seiten 5-8 minuten backen.